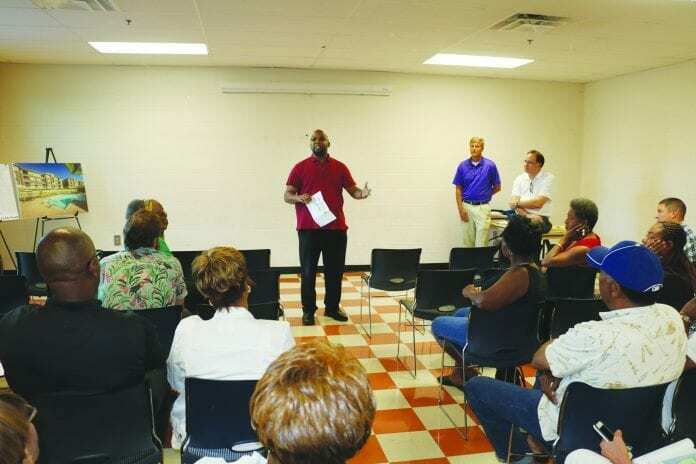 NASHVILLE, TN — On short notice dozens of District 2 residents packed into the Hartman Park Community Center June 19 to hear about Buena Vista Downs, a new low-income apartment complex being proposed for the Haynes Heights neighborhood. They didn’t want it. Developer Scott Brian. made a presentation and fielded questions from the audience. District 2 Councilman DeCosta Hastings showed up late and apologized to the crowd. They gave him a hard time about not keeping them informed. “Now hold on. Hold on, now,” Hastings implored the crowd. “We don’t have to fight against every development that is looking to come forward,” he said. “We don’t need to fight each other; we need to be on top of it. This is not East Nashville. This is North Nashville and we are going to do it the right way,” he added. A woman in the back of the room asked Hastings if he supported the proposed 216- unit project. “Please, please, please, hold on, hold on. You asked a question. Can you listen, can you listen?” Hastings pleaded. After five minutes of heated discussion, the crowd heard what it was hoping to hear. Hastings then told the group that District 2 has 20 major construction projects underway and one huge one is planned. “We have one $550 million project getting ready to come in that most of the people in this room will not be able to stay in,” Hastings said. 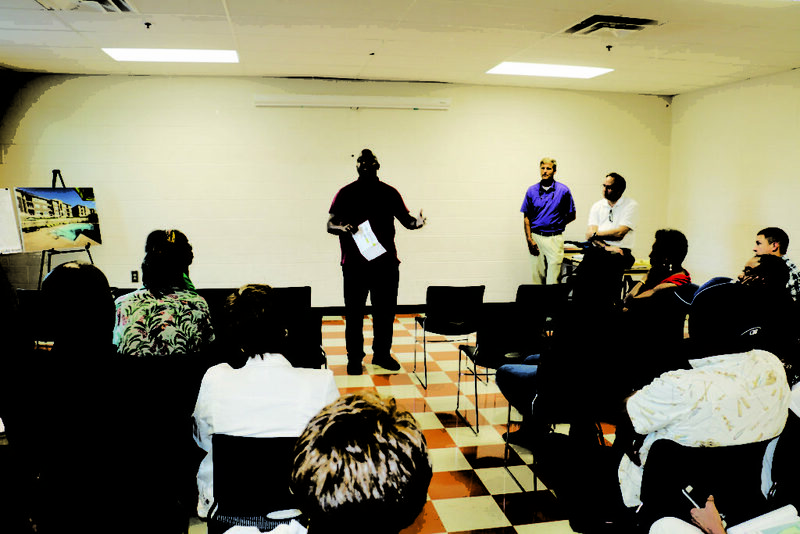 “We need to make room for others like us to be able to sustain our community,” he cautioned. “Did I hear you say you don’t support this project?” Brian asked Hastings. Brian then asked for people to consider a senior housing project with his company in the future. A woman asked Hastings the best way to contact him. Then a wiseacre from the audience asked, “Is that the same number you never answer?” The room burst into laughter. If the developer does not withdraw his application the Buena Vista Downs project will go before the Planning Commission July 13. If it is approved it goes before the city council and Hastings could withdraw the project at that time. 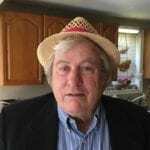 Wayne Sadler is a retired employment analyst. He is a District 2 resident who wants to recall Hastings. “He very rarely supported the wishes of the community. He’s not wise enough to consult with the community before talking to developers and committing to developers as in this situation,” Sadler said. There is a need for affordable housing but putting too many poor people on top of each other engenders crime, says Sadler. “The problem is high density affordable housing,” he said. In 2015, Metro police responded to 980 calls from Overlook Ridge Apartments at 2400 Buena Vista Pike. That section 8 complex has 199 units with 1-3 bedroom apartments and rents range from $748 to $1,008 a month. The proposed site for the Buena Vista Downs project is nearby and would have 216 units with rents from $840 to $960 a month. “It’s a big imposition on the community where already there is a level of poverty. When you concentrate even more in the area, you get problems,” Sadler said. The Metropolitan Development and Housing Authority (MDHA) is taking public comment on a 2017 Fair Housing Assessment it has prepared under guidelines from the U.S. Department of Housing and Urban Development (HUD). The gist of the 63-page report is that concentrations of poverty have high unemployment, bad schools, violent crime, poor public transportation, unhealthy people, and generally a lack of opportunity for residents of public housing projects. The big new idea is to get rid of them. MDHA’s Chief Operating Officer, David “Buck” Dellinger said mixed income developments that provide workforce housing and housing for low income families as well as market rate housing are proving successful in cities like Chicago, San Francisco, New York, and New Orleans. Nashville has moved in that direction and the $11.5 million Cheatham Place expansion on Rosa Parks Boulevard is but one example. One fifth of the apartments in that complex are market rate and the rest are low-income units. Hastings referred to this new approach to public housing at the June 18 community meeting when he told the crowd that he, more than anyone, is fighting against the housing bond sector and against every other plan to tear down Nashville’s public housing projects. “MDHA is taking down all of our housing complexes. There will be not be a one,” he told the crowd. ”The state of Tennessee has to take over. For you to fill out an application to get into affordable house, public housing, you have to go through the state side because we are no longer accepting applications,” he said. Since the 1960s, public housing has been built with federal dollars. Local agencies build and maintain them. The projects MDHA manages belong to HUD. The new federal approach to public housing involves giving the land to the state or to local agencies like MDHA that can take out long-term loans and partner with the private sector in order to raise the capital to build new affordable housing. Critics say it is a huge gamble to mortgage public land near the city center worth millions of dollars in the hope that it will get rid of urban blight and solve all the problems associated with the pockets of poverty that exist now in Nashville. MDHA’s Dellinger says all of the residents in its public housing projects will get new and better homes in the same area where they live now. But critics of the Buena Vista Downs project say MDHA just wants to move them across the river into another black neighborhood. And the developer will make money off the deal. “Our community needs choices,” said Winnie Forrester, President of Haynes Heights Neighborhood Association. “I am concerned about the concentration of poverty by locating so many low-income rental projects along the West Trinity Lane corridor. I am in favor of many types of affordable housing, however it needs to be planned as a mixed income and diversified development,” she said.